...than to regret something you haven't done! You’d think that 9 months would be plenty of time to get used to the idea that you’re going to be a parent. It isn’t! At least it wasn’t for me, though I don’t think any amount of time would have done the trick. Despite spending a ton of time thinking about being a parent, reading books, researching online, going to ante-natal classes etc. the reality of it didn’t really sink in until a few moments after the birth when I was holding my new son in my arms and wondering what the heck do I do now! Those first few weeks were a blur, not least because we were in and out of hospital several times each week due to some initial health concerns (which thankfully sorted themselves out after the first month) but after that things started to settle down. We started to get into a routine, I started to get some work done again (programming isn’t something which comes easily with high stress levels, very little street, and a brain which is feedling completely befuddled – at least not for me!) and my thoughts were at least able to focus slightly further into the future than the current crying fit, or the next nappy change. Now almost 2 months in, and I’m actually really enjoying being a dad. The cliche that you don’t understand what it’s like until you do it really does seem to be the case here, and I’m both enjoying the time spent with the little guy now while also looking forward to all the fun and adventures to be had in the coming years – teaching him to read, playing with Lego and scalextric, riding bikes, going fishing, building camp fires, and all the thousands of other things big and small. One thing I’ve been thinking about a lot is learning. What will I be able to teach him as he develops, and what skills and knowledge would I like to be able to teach him but I’m lacking. Art is one thing which sprung to mind – I’ve never been very good at drawing/painting and so I’m going to try and address that. I don’t ever expect to be a great artist, but I’d like some basic drawing skills to be able to pass on. Music is another – I can knock out a few chords on a guitar or a ukelele but I’ve never learned to read music notation very well and I’ve always wanted to learn to play piano but have never got around to it. Now I have an additional reason to put in the effort to learn, so I can later teach, so playing piano and learning to draw to a reasonable standard are now on my list. Last weekend I was asked to give a short speech at our martial arts club’s annual awards night. I had just completed my 3rd gup grading, my most gruelling grading to date, and with a stinking cold it was a true battle. Normally I strive for the best I possibly can be in a grading, but feeling as rough as I did I had a different game plan to usual – head down, grit my teeth and simply get through it. My thinking was, get it out of the way and then I can go home, have a Lemsip and chill on the sofa for the afternoon playing some Xbox – after all, I had earned it! Public speaking has never come easily to me, in fact for most of my life it has been something I feared and actively avoided at all costs. For my communications A-level I had to give a small presentation (to only 3 people!) as part of my final exam, and I was so nervous that I sat in the college refectory drinking vodka out of a coffee flask to try and calm my nerves! However, over the years I have become less intimidated, and to a degree more interested in the art of public speaking. I put that down primarily to one thing. In my late twenties, I became involved with a network marketing business which I ran for about 5 years. At first I despised the fact that it involved a certain amount of public speaking (from sharing ideas and teaching the business to individuals and small groups, to giving live webinars, and standing up and giving presentations to a room filled with hundreds of business people) but over time it forced me out of my comfort zone and taught me valuable skills. In fact, while there are many things that I disliked about that business, I’m very grateful that I was involved with it due to that education and experience. After not being involved with a business like that for several years now (in my primary business as a game developer I can go weeks or even months without even meeting with a single client – unless Skype meetings count!) it seems that my martial arts are taking up the mantle of forcing me out of that particular comfort zone. Not only am I now being asked to speak, but I’m also being given the opportunity to teach – I recently began helping out as an assistant instructor for the kid’s karate class one evening a week. And once again, just as with my old network marketing business, I’m thankful for the opportunity even though it makes me a little uncomfortable… but I guess that’s why they call it a comfort zone! By all accounts my short talk at the awards night was well received, and week on week I’m learning and gaining experience teaching the kids. As a mentor I had during my network marketing days was fond of saying – the one who gets the most out of any meeting is the one standing at the front of the room, and I truly believe that – you really do learn more from teaching than you do from being taught to, because in order to teach or speak you need to truly understand and so it forces you to think on a deeper level, and grow as a person. So once again, my martial arts study has proven to be so much more than simply learning to punch and kick. People often ask me why I train (why would you give up 3 or 4 evenings a week and £50 a month to be bruised and battered and occasionally injured, to do hundreds of push-ups and sit-ups and all manner of other torturous exercises, and every few months go through a gruelling grading just for the privilege of tying a different coloured belt around your waist?) The answers of course are many… to keep fit, as a break and contrast from the sedentary work of sitting in front of a computer all day, for the fun of training and learning, and the excitement of competing, for the friendships you form by training hard together… the list goes on. Now it seems that another item can be added to that list – to once again have something to drive me to improve my public speaking and teaching, skills that are both valuable and rewarding, yet without my martial arts I would not currently require or have an opportunity to practice. Once again, martial arts is enriching my life, and making me grow as a person in new ways. I’ve decided to start blogging here again, after an unbelievably long break. Why? Several reasons, but basically for the same reasons I started this blog in the first place – to focus on my personal goals, to get my thoughts straight, and as a record of where my life is and where it’s going. This time though I intend to do things a little differently. Firstly, I started this blog for me and never really intended many people to read it. However, when I started reading about blogging and talking to other bloggers on social media I kept seeing the same “helpful” information everywhere. People told me to “write for an audience”, and focus on visitors, and most of all to add advertising like Google Adsense. Well, I’m just not interested in any of that so this time I’m doing it my way. I’ve removed all advertising from the site, and I’ll be writing what I want to write not what I think people want to read! There are several reasons I want to do this now, but the biggest one is that my wife and I are expecting our first son in just 3 months time. I’m filled with a mixture of excitement and terror at the prospects of being responsible for another human being, bringing him into a scary and confusing world, and being a father. I know my life is going to change dramatically over the coming months and years, and I think that writing will be a great way to both get my thoughts in order and also to keep a record of our lives which I can later share with him. I recently read an article about a concept called 750 words. The idea being that writing, every day, can be really beneficial. I already write, in fact I’ve written and published a book in the past, and over the years have written countless articles for web sites and magazines, but I’ve never really stuck to a structured schedule of writing every day. I’ve looked into it, and there are countless books, web sites and articles saying basically the same thing – writing every day can bring a wealth of benefits, and the “magic number” for most people seems to be about 750 words (Stephen King apparently says he writes 1500 words every day and cites that as the secret to his success!). I’m not planning on writing on this blog every day. In fact, I’ve already been putting this idea into practice over the past couple of weeks, writing articles on a couple of other non-personal sites that I manage, and putting ideas down for a future book (about arachnophobia), but I think that adding some personal writing into the mix will be of benefit and also allow me to get my 750 words done on days when I don’t feel like writing on specific topics for those other projects. I do have a bunch of ideas for things I want to talk about on here, from my hobbies and interests (martial arts, books, game design, cooking…) to the process of becoming a father, and things I learn about in my day to day life from reading books and sites, listening to podcasts, or simply living. Will this blog dry up again in a few months, or will I still be posting here in 10 years? I have no idea, but for now I intend to post here regularly and see how things go. I never really knew either of my grandfathers, as they both died when I was very young. I’ve heard stories of course, but it wasn’t until this week that I realised the scope of some of them! My maternal grandfather, Les Turner, was an engineer and I knew he was very talented. 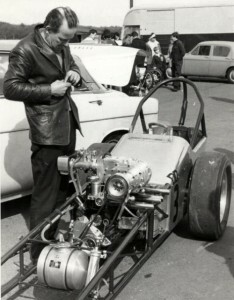 He built a number of guitars (two of which I own, that was the primary reason I learned to play) but among other things I had heard stories that back in the 1960s he had built and raced a dragster. I always assumed it was just a little hobby, but after speaking with my older sister and doing a little research I discovered that it was more than that – he took his racing very seriously, and was very successful – winning a number of events and setting new records. 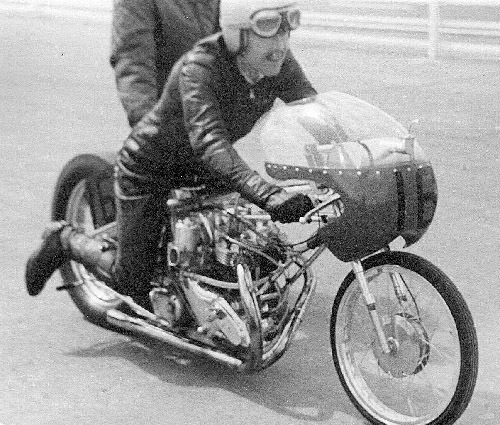 It seems he was a skilled engineer in his workshop, and a fearless and competitive racer on the track so I guess being an action geek runs in the family! 1/4 mile in 11.06 sec. // 500m in 12.53 sec. // Kilo in 20.2 sec. // Mile in 29.62 sec. He raced and tweaked it over several years, constantly trying to squeeze every last drop of power from it, and apparently getting a lot of respect from other builders and racers with one report stating it was “one of the best turned out cars of that era with green frame and alloy panels”. Jon Sewell purchased the car in the late 1970’s and was so impressed by Turner’s superb block work with its billet steel crank and rods, flywheel and sintered clutch in a Lotus alloy bellhousing, and an Lotus alloy diff. — that Jon realized this could be a terrific National Hot Rod motor, and it went into his #222 hot rod which he took the the Spedeworth wars racing against the likes of George Polley. It’s been a looooong time since I did any martial arts. Well over 15 years in fact, since the Taekwondo club I was training with closed their doors, and I decided not to look for an alternative. I’d become rather disillusioned with it, increasingly feeling like the instructors at that club were merely going through the motions and not taking it seriously. I remember on more than one occasion asking a question about the application of a technique, and being told that “I don’t need to know the answer to that for my grading” – as if passing the next grading was the only thing that mattered! So when that club closed down, I decided not to join another but instead went to a Thai boxing gym with a friend who had trained under Master Sken in Manchester. Unfortunately I aggravated an old knee injury within a few weeks that stopped me being able to train and took many months to heal. Then I ended up going travelling, and then started my business… and so that was the end of my martial arts… until now! I’ve often thought about getting back into martial arts, but always seemed to be too busy with other things to get out there and look for a suitable club. Then I went on our usual snowboarding trip in February, and met AJ – a friend of a friend who happens to be a second Dan in Tang Soo Do who trains at a local club. We got chatting, and very quickly I wanted to try it. That was a couple of months ago now, and I’ve not been disappointed. Tang Soo Do wasn’t an art I’d heard much about before, but I’m really glad to have found out about it, and specifically about ISK Martial Arts – not only is the club extremely friendly (and very well equipped – by far the best dojang I’ve ever been in!) but they take it seriously! They like to train hard, and take all aspects of the art seriously which s awesome. I’ve only been to a few sessions so far, but every time it’s ended sooner than I was expecting (time flies when you’re having fun I guess!) despite my body feeling battered the next day. In fact, I’ve only been going to one class a week because it’s been taking me a full 7 days to recover each time, but this week I intend to do 2 sessions because I’m absolutely loving it. Feels so good to be learning a martial art again – can’t wait for the next session tomorrow night! Writing and publishing a book has been on my LIST for a long time, and now it’s time to tick that one off! 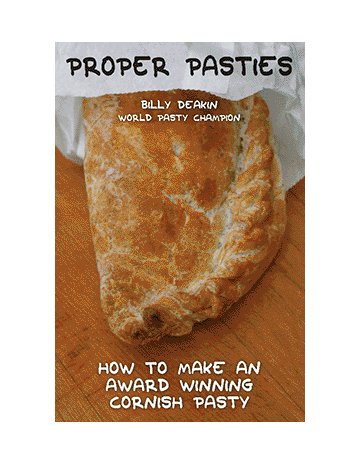 Last year I entered, and won the inaugural World Pasty Championships, and this year I successfully defended my title. The amount of interest from the public and the media was massive so I figured there would be genuine interest in a book. I’ve written plenty of blog posts and articles over the years, on a wide range of topics from food to poker, game development to tarantulas and more, but I’ve actually written a book. Since I don’t have any contacts in the publishing industry I decided to go the self publishing route, and to try and part fund the publishing via a campaign on the crowd funding website Kickstarter. Please take a moment to view the Kickstarter Page and pledge your support – every single pledge really does count no matter how small. OK let me first say that I love the concept, the interface is very nice, the way the app syncs to the website is smooth and effortless, there are loads of options and even the voice acting is pretty good… but unfortunately, for me at least, the app is broken due to a fundamental flaw. The problem is that the app is designed for “missions” of a very specific length – 30 minutes, or 1 hours. If your runs don’t fit with those 2 options then the app really doesn’t work as well as it should. The first time I tried the app I stepped out the door and started running, and I was impressed. The “game” starts immediately and worked well. It didn’t work with my music, but turned out that I just needed to select a playlist so that was my fault (though they could have made that clearer) The problem though, was I did a quick loop and got home after 25 minutes with 5 minutes of “mission time” to spare. No problem, I figured that would just be added on to my next run. So, next time I stepped out the door I clicked “continue” and it picked up from where it left off before – fantastic. This time I had set my music up, so in between game audio it played Green Day to me and I was a happy boy… until after 5 minutes of game time and 2 songs when it just stopped… no zombies, no music, just silence! Got home, synced the app to the web site and turns out the app just plain quit after the first “mission” was ended. But there was no audio warning, no “would you like to start mission 2″, nothing. That means the final 20 minutes of my second run were not tracked, no data at all. Now to me that’s just annoying. The game uses GPS so it knows when you get home, so why not just start mission 2, or at least keep tracking data (and playing music) until you get back to the start, or the user clicks a “end run” button? 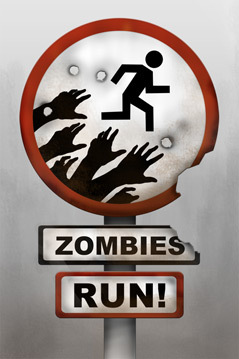 So I’m afraid I won’t be using Zombies, Run again and I’ll be going back to Runtracker… I just hope that they either fix these annoying problems in a future update, or a sequel because like I say the idea is great, but the app is useless for someone like me who doesn’t run for exactly 30 or 60 minutes every time! Time to cross another item off my list, but this is a strange one… and while I’ve crossed it off, it’s technically still a work in progress and I suspect it will be for some time – beating my fear of spiders! It’s something which has bugged me (pun intended) for a very long time. 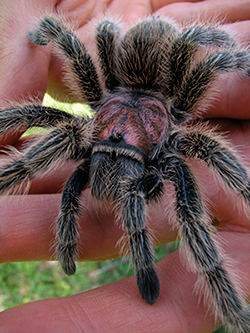 I’m not really afraid of anything else (nothing irrational anyway) and I know they are “just little spiders” and that (in general) they can’t hurt me – but I’be always had a profound and deep fear of them. The weird thing is, I’m still not 100% sure what it is about them that has always bothered me. They have lots of legs, but so do crabs and lobsters and I’m fine with them… they are small and fast, but so are crickets and I’m fine with them… they have big teeth, but do does my boa constrictor and my rottweiler! I first read about this app a while ago over at Lifehacker.com and it sounded awesome, but at the time I was in the middle of a non-running workout schedule so decided to put off buying it. Well this morning I discovered that the app was currently half price (from the normal $7.99) and I’ve just decided to start a new running schedule over the coming weeks so it seemed perfect. The app’s downloading right now (it’s a few hundred meg) so I’ll post again once I’ve had a try, but from the reviews I’ve read in the past I’m sure I’m going to love it. Basically it’s a fitness app along the lines of Runtracker but gamified around the premise that you’re trying to escape from zombies… There are a bunch of “missions” to choose from, and you choose one before each run. Then you run with your phone in your pocket and your headphones in, and you hear a story as you’re running where you get prompts and feedback. The app is currently half price (not sure for how long) for iPhone and Android. Why, oh why are Macs selling so well? is there some sort of subliminal messaging in Apple’s advertising that is hypnotising people? I went into the local Apple store recently to look for an iPhone case and was amazed at how many people were in there, and especially looking at the iMacs, seemingly entranced by them. I’m about to upgrade my computer myself so I decided to take a look at the new iMac 27″ model, hoping that would be a suitable replacement for my main desktop PC and my aging MacBook Pro since I rarely take a laptop with me these days, just replying on my phone and iPad when I’m not in the office. No mic input (what?) Seriously, you can’t just plug a headset in for Skype, you need to invest an extra £35 in an “iMic” interface, for a feature that’s included in every £299 PC laptop! All USB ports at the back where you can’t reach them! Because obviously that will be fun, fishing around the back for your USB stick which you need to keep using because you can’t use a DVD! No Firewire – want to hookup a video camera, or a prosumer audio device… not on an iMac, not unless you want to pay an extra (£35) for the add on interface! No DVI ports – because obviously everyone with a Mac wants to spent £1000 on an Apple branded external monitor rather than plugging in a couple of their existing monitors… and of course it’s £25 (per port!!) for Thunderbolt to DVI adapters! And for the privilege of buying a computer with all these wonderful benefits/omissions… they only charge 3 times the price of an equivalent PC! Seriously Apple, I’d like to be able to order a new iMac but there’s just no way I can justify it, time to build another PC I guess!